Buying Advice: 😀 Positive. Interesting Malt with reasonable P/Q ratio. Crisp and Fruity with Mineral, Grassy, Waxy and Spicy notes as well. The Alcohol is quite noticeable but that's no big surprise given the ABV of close to 60%. I find Sweet Barley, Buttered Toast, Toffee, Vanilla, Grass, Straw, Earth, Dried Fruit like Raisins and Apricots, Orange Marmalade, Tinned Pineapple, Saw Dust, Wet Stone, Heather-Honey, Bee-Wax, Sugared Almonds, Stewed Apple, Dusty Road, Leather, Milk Chocolate, Sweet Licorice, Ginger, Pepper and a sprinkle of Fresh Mint. Perhaps the faintest hint of a piece of Bacon on a distant BBQ. Be sure to give this Mortlach enough time in the glass in order to reveal its Aromas. Very strong delivery thanks to the high ABV. Mainly Sweet but with a few Bitter, Sour, Oaky, Earthy and Spicy notes for balance. I find Sweet Barley, Butterscotch, Caramel, Marzipan, Dried Fruit, Milk- and White Chocolate, Vanilla, Stewed Apples, Almonds, Dirty Road, Salt, Pepper, Cinnamon, Ginger, light Licorice, Orange Marmalade, Grapefruit, Sour Grapes or Grappa and hints of Leather and Raspberry. Middle-Long, warming and Spicy. Sweet at first but quite Dry in the end with a slight Woody Bitterness. I find Toasted Barley, Sticky Toffee, Caramel, Stewed Apples, Marzipan/Almonds, Honey, Milk Chocolate, Toasted Oak, Grapefruit, Salted Almonds, Orange Marmalade, Lemon Zest, Pepper, Ginger, Cinnamon and hints of Leather and Raspberry Jam. The Alcohol remains strong until the end. I added 3 drops of Water and that helps to calm down the Alcohol on the Nose. The Aromas remain the same but they become more accessible. The same goes for the Palate. Perhaps some additional Floral notes here. The Finish becomes shorter, more Mineral and with a Metallic note I could live without. 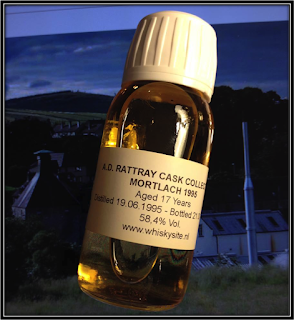 Still, this Mortlach deserves a few drops of Water! The distillery was founded in 1823 by James Findlater. It changed hands various times before being bought by John Walker & Sons in 1923. The latter was purchased by Distillers Company Ltd that later became part of Diageo. 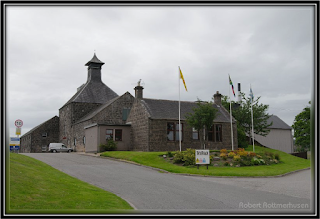 Mortlach is located close to the centre of Dufftown. Most of the Spirit is used for the Johnnie Walker Blends but since 2014 the Malt core range was introduced that consists of the NAS Rare Old, the Duty Free version called Special Strength, the 18 Years and the 25 Years. A.D. Rattray was founded in 1868 by Andrew Dewar Rattray. It suffered during the crisis of the early 1900's. It changed hands various times before returning to the family. Current owner is Tim Morrison, a fourth generation descendant of the founder who used to work for Morrison Bowmore Distillers. He launched the Cask Selection series in 2004. The Spirit for today's Single Cask Whisky was distilled on the 19th of June 1995 and was bottled at Cask Strength on January 21, 2013. 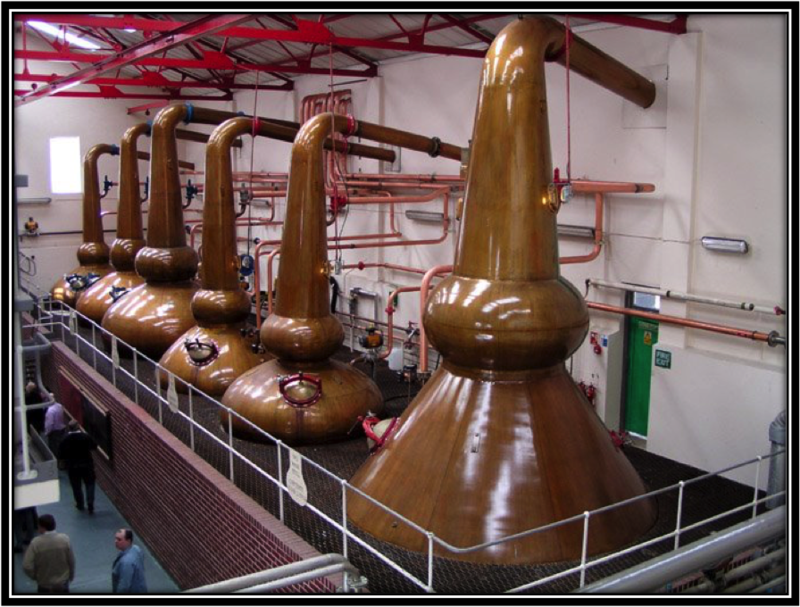 Mortlach is equipped with six stills of various sizes. Unlike in most distilleries, these stills operate separately, rather than in pairs. Cooling of the vapours takes place with worm tubs. The Lyne arms are pointed downwards to create a full and meaty Spirit, quite different from your usual Speyside profile. 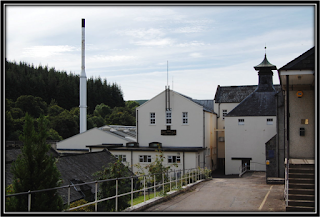 The water for the Whisky is sourced in the Conval Hills. This Mortlach matured for 17 Years in a Bourbon Hogshead with Cask # 3426. Only 264 bottles were drawn from the cask. 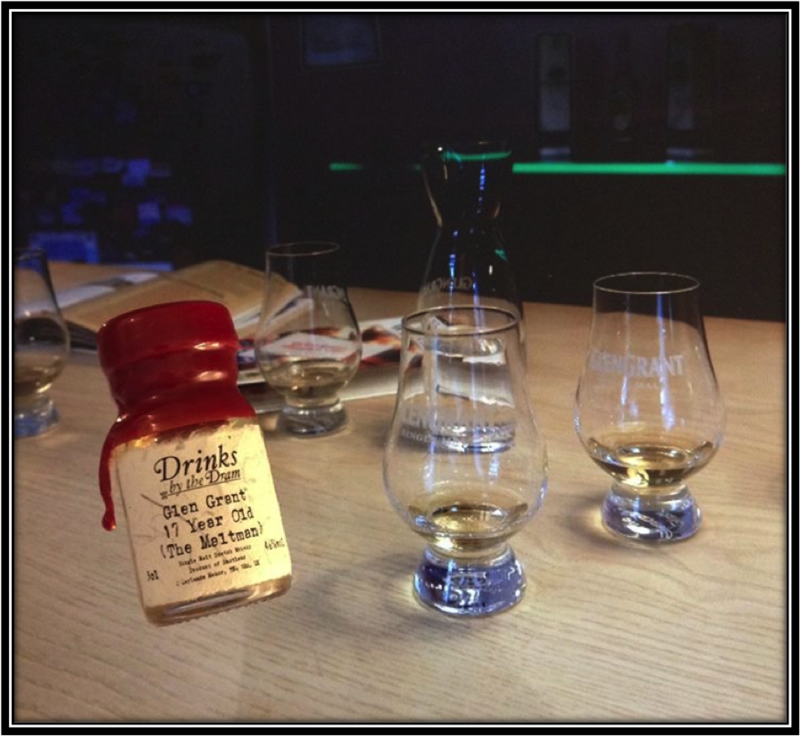 Quite different when compared to your average Speyside Single Malt. If Speyside is Flower Power, this Mortlach is Dylan's Like a Rolling Stone. It's Edgy, almost Dirty sometimes and the high ABV seems to be spot on for this Malt. I would not recommend this Mortlach to beginning Whisky drinkers but for advanced Whisky fans this is a nice Malt to discuss on a Tasting session with some friends! It's not perfect and it's a bit untidy in places but it's certainly interesting and that's exactly what seems to be missing with lots of today's mainstream modern-cut Single Malts. I like it! Nose: Earthy Peat, Cold Smoke, Tar, Ashes, Leather, light Rubber, Cured Meat, Wet Paper, Soy Sauce, Dusty Shelves, Vanilla Flavoured Tobacco, Dried Herbs, Charred Oak, Cereals, Hay, Wax, Toffee, Red Apple, Nectarine, Grapefruit Juice, Sugared Tea, Lemon-Grass, Menthol, Nutmeg and Cinnamon. The Alcohol is reasonably well-integrated. 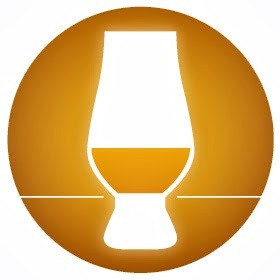 The Nose is quite similar to Islay Malts. It's not bad but the Peat and Smoke are a bit dominant. I would have liked some more Fruit for balance. Palate: Peaty, Bitter-Sweet and Spicy with Dirty Peat, Cold Smoke, Leather, Tar, Soot, Ashes, Burnt Straw, Wet Newspaper, Toffee, Vanilla, Marzipan, Cinnamon, Chili Pepper, Nutmeg, Lemon-Grass, Barley, Charred Oak, Rubber, Red Apple and Mint. Slightly Sour towards the end. I miss a bit of Balance here as well. Sour Apples, Lemon, Salted Butter, Toast, Dried Herbs, Sugared Tea, Menthol, Pepper, Nutmeg, Ginger and Cinnamon. 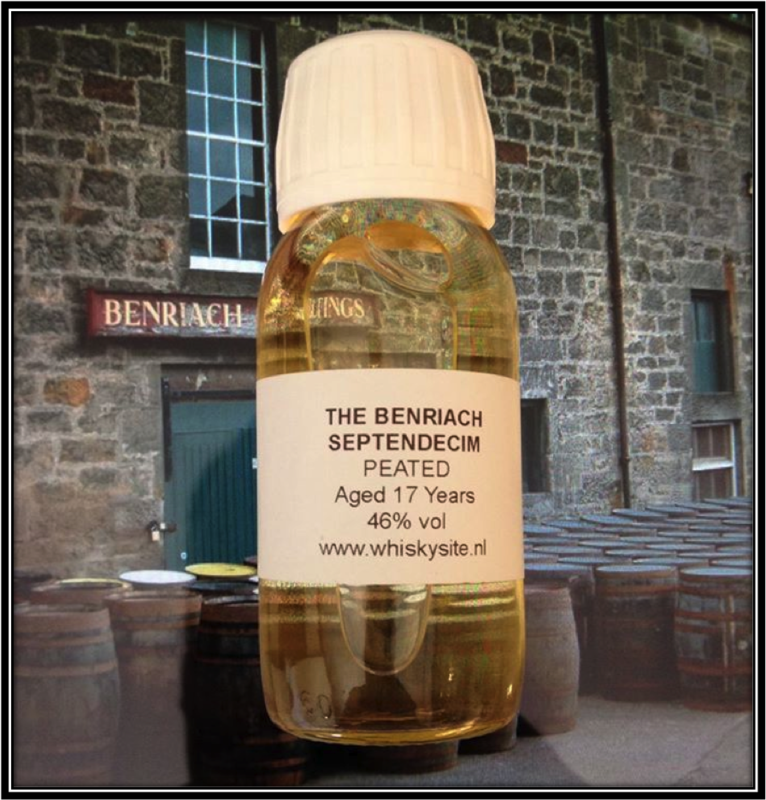 The BenRiach Septendecim does not improve with added Water. 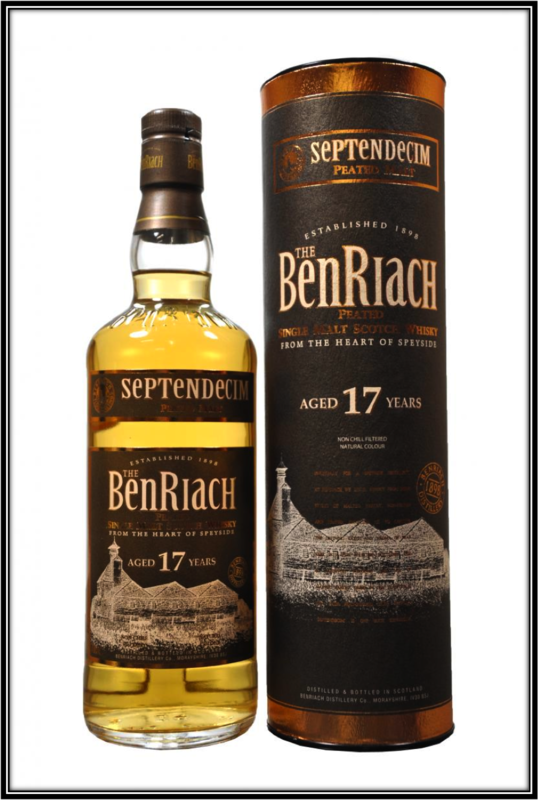 General Remarks: The BenRiach distillery is located in the heart of Speyside between Elgin and Rothes. It was founded around 1898 by John Duff, the owner of the nearby Longmorn distillery. Today it's one of the few distilleries with its own Malting Floors. 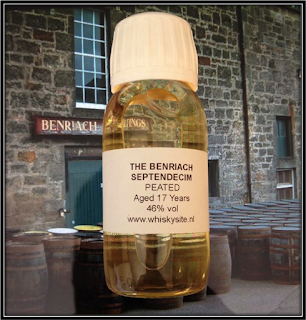 Since 2004, it is independently owned by BenRiach Distillery Company. A lot of their production goes into the Chivas Regal Blends. 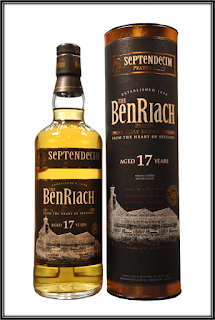 The Septendecim (Latin for Seventeen) was launched in early 2012 and became a regular peated distillery expression. It matures in Refill Ex-Bourbon Casks and is not Chill-Filtered. It sells at an average 65 US Dollars (November 2015). Conclusion: This is a perfect imitation of an average peated Islay Malt. 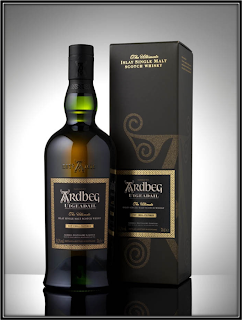 It's a bit of a One-Trick Pony as the Peat, Smoke and affiliated Aromas and Flavours are in complete control. I would have liked to find more Fruit for balance. I also find it a bit Flat on the Palate. And I'm not too fond of the Rubber notes I found. 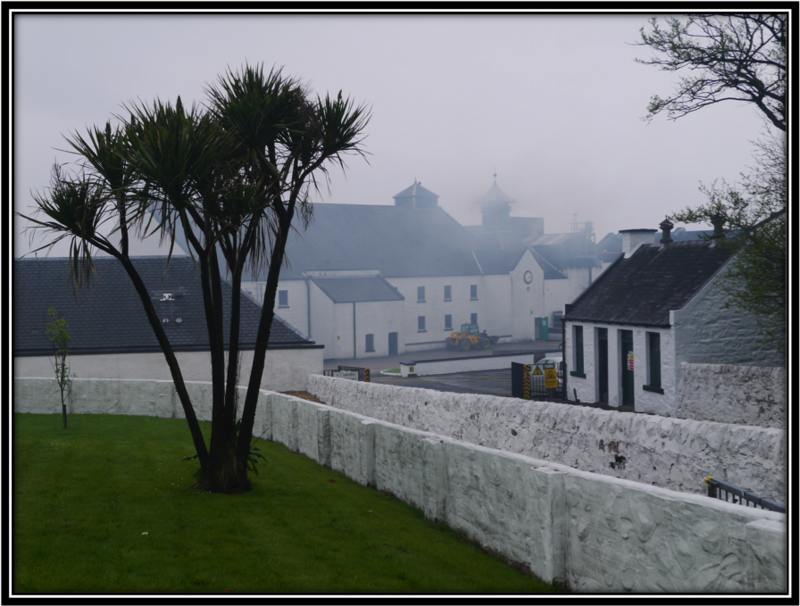 Nowadays a lot of distilleries outside Islay are producing peated Malts. I have nothing against that as long as it adds something to the original distillery character. I don't think that's the case here. This smells and taste like an Islay whisky produced by BenRiach. So why would you consider buying this if you are an Islay fan? Because it's an acceptable peaty alternative, that is reasonably priced for a 17 years old Single Malt. Nose: Sweet, Malty, Floral and Fruity. The Alcohol is noticeable and you need to find your way around it. But when you succeed in doing so you will find a basket full of Fresh Fruit that contains Apples, Pears, Pineapples, Peaches, Nectarines and Bananas. I also find Sweet Barley, Oak and Resin, Wax, Custard Pudding, light Bourbon, light Honey, Grass, Lemon Zest, lightly Buttered Toast and light Wood Spices. Despite all these Aromas, it's not a very Complex Nose. Malt and Fruit are the main drivers. It's a pity that the Alcohol is not fully integrated. Palate: Good- and Creamy Delivery. Here, the ABV works fine. Sweet at first but Oak and Spice quickly appear on stage. It's less Fruity than the Nose suggests. I find Sweet Barley, Charred Oak, Grass, Citrus (Mainly Orange), Apple, Melon, Vanilla, Bitter Chocolate, Pepper, Nutmeg, Cinnamon, Ginger, light Licorice and a hint of Espresso. Finish: Middle-Long, Woody, Spicy and Sweet with a very light Bitterness in the end. I find Sugar, Marzipan, Sweet Barley, Vanilla, Lemon, Pepper, Nutmeg, Cinnamon, light Licorice, Charred Oak and hints of Aniseed and After Eight. I added a bit of Water and on the Nose you get More Malt and some Floral Perfume. On the Palate the Malt and Spices become even more dominant and the Finish gets rather Short. It's nice to add a bit of Water before Nosing but you better sip it Neat. Glen Grant is the only Scottish Distillery that was named after its founders/ owners John and James Grant. The Distillery is located just off the A 941 in Rothes, Morayshire, around 10 miles South of Elgin. It was founded by the Grant Brothers in 1840 and since 2006 it belongs to the Italian Campari Group. 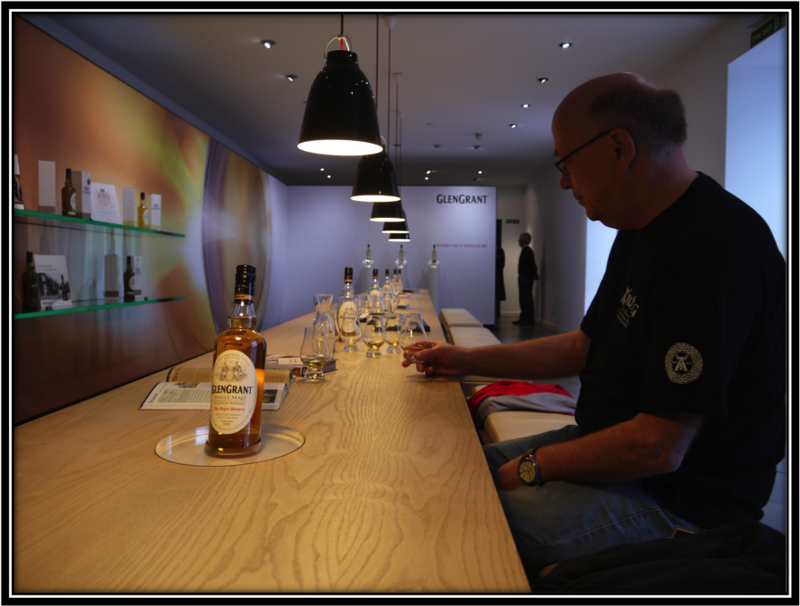 Glen Grant is mostly known as a Single Malt, especially in Italy but it's also a part of the Chivas Regal - and Old Smuggler Braemar Blends. The Malt I'm tasting today was distilled in September 1995. It matured in an Ex-Bourbon Cask (# 97266) and was bottled in February 2013 by Independent Bottler Meadowside Blending Co. Ltd, Glasgow in their The Maltman Single Cask Series. Meadowside was founded in 2011 by Donald Hart and his son Andrew. This Glen Grant was not Chill-Filtered. Only 276 bottles went to the market. At the moment the average price lies around 90 US Dollars (November 2015). Conclusion: It's surely a coincidence that this Glen Grant was released as part of Maidenhead's The Maltman series. Because it is a very Malt driven Whisky. On the Nose, the Barley is accompanied by lots of Fruit and that gives a very nice combination. Unfortunately, the Alcohol is a little too present in my opinion. The same Alcohol however guarantees a good Delivery. The lack of sufficient Fruit on the Palate allow Oak and Spices to dominate. I would have liked to see more balance there. The Finish is okay but simply does not provoke excitement. All in all this Glen Grant is a somewhat uneventful Speysider. Not bad but not great either.